Others have tried it but I wanted to go a step further and modify the re-release kit using where possible off the shelf parts to narrow the wheel base to the same as the original, lower the body to sit right and allow the original wheels/tyres to be fitted and end up with a modern machine that would handle well but look as good as the original. Now THAT'S a modern twist on a classic! I thought this would be the hard part but actually turned out to be very easy. The first job was to change the large output bevel gears to splined. I used gears from the Twin Detonator but almost all the modern gearboxes with a sealed gear diff use these same metal gears. My thinking here was that a splined output would allow a standard pin drive output cup and therefore loads of different length dog bone options depending on the length of wishbones. The re-release kit comes with plastic dog bones and cups. Nothing wrong with these but it does cut down options when it comes to compatibility. While I was there it seemed silly not to replace the nylon bearings with 1150 ballraces. Ah ha! The re-release Frog kit uses the original wheels but a pin drive dog bone so the axles will be just the job. Here you can see them installed in the standard hub carriers. There's a bit too much axle here which will need spacing but it's enough to work with for now so we can see how the wheels will sit. The main problem here is that the trailing arms on Frog and Wild One have a big distance between the bearings, the uprights I have used here are TL-01 and narrower. It's easily fixed with a spacer though, standard 1150 bush to the rescue, more on that later though. Right, so we now have the car built up with the original wheels. The front wheels/tyres fit straight on although they are a little tight, you could rectify this with Super Astute front uprights as the steering arms angle in more to clear the tyre but it's actually only just rubbing slightly on the rims, easily fixed with a little grinding down of the arm where it touches. These pics show you just how wide this thing is and gives a comparison with a vintage model. There's obviously more offset on the old wheels but this is crazy looking! A lot of work to do! So, let's start the mods with the wishbones, there are several options that I'm sure would work here depending on how wide or narrow you want the back end but I found that TL-01 (Stadium Raider) wishbones and uprights were perfect and consequently so were the dog bones. Remember whatever wishbones you choose the corresponding dog bones should be the right length. Top links were made up using threaded rod, Tamiya ball nuts and plastic 5mm adjusters. I'm actually surprised how much movement this allows, seems to work really well and gives the same width as the original buggy. You can see from the photo they give a different result depending on how wide you want the front end. I actually found that the DF-02 wishbones (2nd ones down) work very well if you are using Rough Rider wheels as they are narrower than vintage Holiday Buggy ones. For me though the objective was original wheels so the 3rd option was the one to go for. If you look at the photo you can see where you need to cut. The wishbones are soft and by cutting here you will not lose strength, the outer damper mounting points conveniently are perfect too for the screw pin. Cut with a saw or knife. Take care here kids and always ask a parent/guardian to supervise. Again referring to the photo you'll need to use a knife to remove from of the excess plastic inside the wishbone to allow the upright to hinge and also space to mount a ball joint for the damper. Ok looking good, the standard uprights fit straight on and again I made up some top links from threaded rod, ball nuts and adjusters. The lower ball joint is long threaded from the Astute but you could use a ball nut and insert a 3mm bolt from the back. Inserting the hinge pin from the rear of the wishbone gives you clearance here. Alternatively you could use shafts and e-clips. Next up - The suspension mounts at the front. 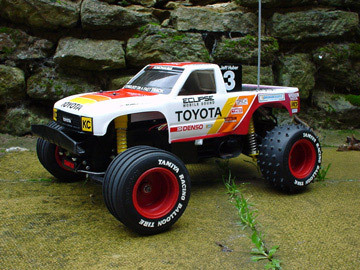 I simply wasn't happy with how high the shell sits at the front, infact Tamiya's official photos show the shell sitting down onto the front bumper yet the kit when assembled reveals a yawning gap. The kit plastic shock towers can be cut and lower mounting point used if you want to take the easy way out here but as I said it wanted the shell to sit right and also not lean uphill when viewed from the side in relation to the chassis tub. If you do use the lower mounting point on the standard shock tower there's a limit to how low the shell will go as the sloping bonnet touches the top of the dampers. It turns out that an Astute front shock tower when turned upside down and cut is about right, a little adjustment here and there and it fits just right. The standard body mount just needs to be cut and mounted and you can then cut the original shock tower right down. It's all looking good! The dampers I have used are standard modern CVA mini units at the front and medium at the rear left over from a Dark Impact kit. To be honest most modern shocks will do the job here, you might need to experiment with springs to get it just right though but I hope you agree that it now looks a whole lot better than the standard re-release kit and drives great too. At last, a modern version of our beloved Holiday Buggy using modern running gear but still looking great! I'd love to fill in the holes on the bonnet where the dampers used to stick through but by leaving the stripe decals intact and re-inforcing underneath it's really not that bad. I actually prefer this front bumper to the original too. So there it is, a modern classic! Wheels sitting exactly the same now as the original and shell is sitting down nice and low too. Really hard to tell the difference now from the stance. Fantastic! many thanks for posting this information, i have just finished modding my holiday buggy with silver grasshopper wheels & tyres (i like the padlatrak ones) and it looks a million times better. i also painted the tyre lettering which improved the look significantly! i dont know what tamiya were thinking when they ok'd the standard DT02 arms & wheels - the cheapskates - but thanks to you it looks like a proper buggy! all the best and keep on modding! Thanks for the great article. I was wondering whether you've ever tried the CRP rear wheel adapters? They are available on Ebay. What a fantastic DIY guide! 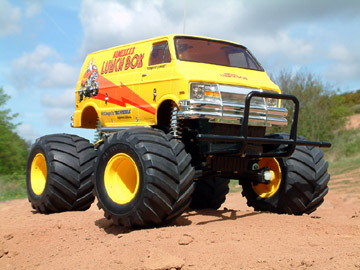 I was excited when I heard about the Sand Rover re-release but was utterly dismayed when I saw the new offering embodied an almost monster-truck / dirt racer sentiment, making me think Tamiya just didn't care about scale looks anymore. With your excellent review I'm now prepared to buy one and do the mods to make it look like it should. Thanks! Very very helpfull, for who cares about scale look like me. Thanks a lot for publishing about your work. I will do it too, as I was looking for some tricks to get a more realistic buggy. 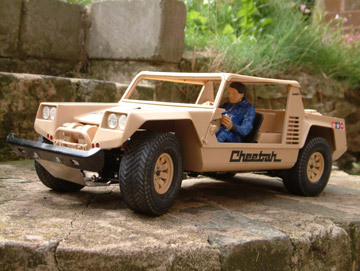 I loved this expert guide so much I bought two Sand Rovers off local ebay. I always loved the shape but was never a fan of its chassis. Well Done and many thanks for sharing. I did actually have Rough Rider/Buggy Champ wheels/tyres on this car at one point during the build because as you say they're much more widely available. I think they suited it very well but I did prefer the look of the HB front wheels because the tyres being nice and chunky seemed to suit the body better. They're a straight fit though on this setup. I would consider the slightly wider DF-02 front wishbones mentioned here with the RR front wheels just to give you the right width at the front. I'll try and post up some pics because it's a good question you raise. well done....I refused to buy an HB simply because of the reediculous wheelbase(com'on Tamya!). You should offer a kit..Id buy an HB if there was a "scale kit" available. Also curious, if you thought tamiya 1.5/1.7 wheels(like on the srb's) would fit on the new set-up as original HB style wheels and tires are near impossible to find? if done right I think they would look even more scale then the OEM HB wheels....your thoughts? thats a good piece of handy work , didnt realise how much those wheels stuck out. a modification worth it . Well done young man! A round of applause! Top work and letsh have some fun with it! 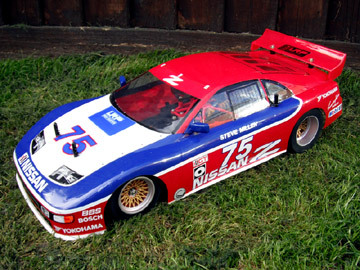 Superb description, the end results are what we all wanted from tamiya but never got. Excellent modifications on a difficult chassis i think. Your wisdom is exceeded only by your boyish good look's. Wow that's awesome! You make it sound like it would be an easy job for anyone with the right parts. Maybe someone should sell a kit? 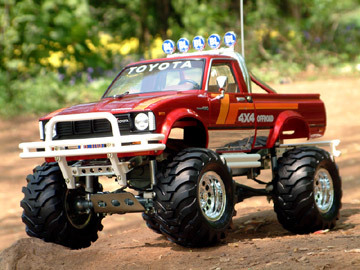 Why didn't Tamiya make the kit like this! ?